Anyone else have a collection of these on their wall? 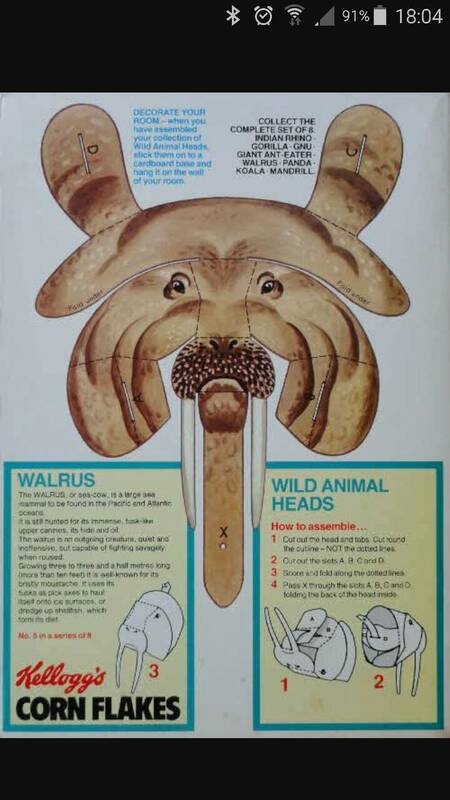 I remember those animal heads, I'm not sure if I cut any out or not. The Sugar Puffs jigsaws - I think I had the one with the boy in green. Do you have any more of these? I remember having the complete set, they all sat on a shelf in the kitchen for ages. My Dad, Gordon Archer, is the artist behind most of the Weetabix Promotions during the 70's & 80's. These included the two for Doctor Who, Star Trek: The Motion Picture, Asterix, Batman & Wonder Woman, Olympic Games (80 & 84 I think), Flash Gordon and also the Weetabix Gang characters for the first 3-4 years. I remember collecting the 'Back To The Future' choose your own adventure-type books in the mid-'80s. There was a series of six which followed the main plot of the movie, and I think they came free with Shreddies (although I might be wrong about the cereal, it was definitely with a cereal though), I managed to get them all after collecting five and swapping a spare with the missing one from one of my friends. I don't have them now though. Only 8 years late but I can say that these were definitely given away in Shreddies. I collected them all and still have them. I also loved Shreddies so not even a chore unlike Shredded Wheat which was so boring you had to really want the gifts to buy it. That's awesome! Were they the ones with the scenes on the back and the glow in the dark transfers or the cut outs?